Make sure that Inventory is selected in the Product box. The Quick Links drop down box allows you to easily access your other Dude Solutions applications. 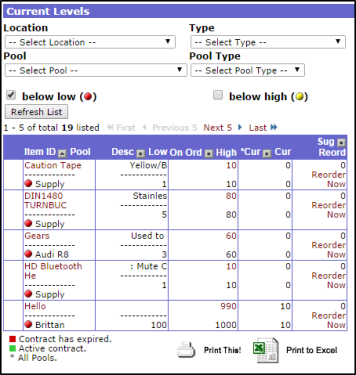 Select the application name from the list to jump between the different programs. Click the Logout link to exit the system. Home - takes you to the InventoryEdge home page. Calendar - takes you to the Calendar page. Catalog - where you can view a catalog of current inventory items. Issue - where you can view issue transactions, create new ones, and run issue reports. 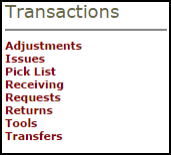 Receiving - where you can view receiving transactions, create new ones, and run receiving transaction reports. Adjustment - where you can view adjustment transactions, create new ones, and run reports. Inventory - where you can view a list of all the inventory items in the account and add new items. The Search For box under the Home tab can be used to find specific inventory items. Enter an Item number or keyword to search for items. The Advanced Search link takes you to a more advanced search form where you can select multiple criteria to find inventory items, transactions, or requests. This section will show you the current levels of inventory items that are below the set low and/or high quantity amount you have set for that item. This helps you to manage your on-hand quantities and reorders. 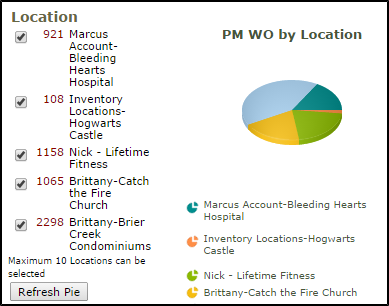 The pie chart sections in the middle of the home page give you a summary of the inventory requests currently in the system. 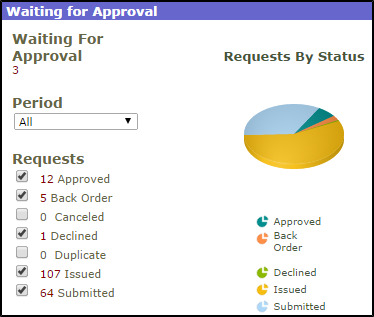 The Waiting for Approval section gives you a breakdown of inventory requests by status. Click on the number under Waiting for Approval to process those requests. The New Inventory Requests section gives you a breakdown of all new requests by Location. 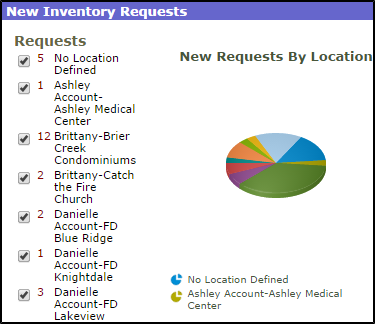 Click on the number in red next to each location to view and process those requests. 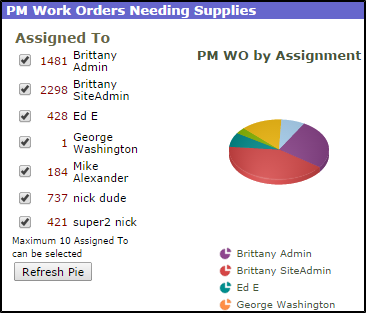 The PM Work Orders Needing Supplies section will show any inventory requests that are automatically generated from your Planned Maintenance schedules. They will appear in these two pie charts, one is sorted by the Assigned To information and the other is sorted by Location. 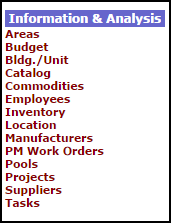 Click on the numbers in red to view a list of those requests and process the transactions. The transaction links on the right side of the home page take you to pages where you can view transaction lists, create new transactions, and run reports. The Information & Analysis section gives you links to all the major components of InventoryEdge. You can click on a link to view, add, and report on that specific information. 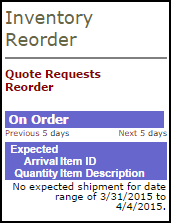 The Inventory Reorder section provides links to quote requests and reorder forms, as well as a list of items that are expected to be delivered in the next five days. 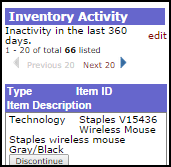 The Inventory Activity section can help you manage your inactive inventory items. Any inventory that does not have any transactions for a period of time will be listed in the section. The system defaults to a period of 180 days, but you can change this time period by clicking on the edit link and entering a new number. You can discontinue items in the list by clicking the corresponding Discontinue button. You can print this list as a PDF or Excel spreadsheet by clicking the print options at the bottom of the list. This section on the left side of the screen displays shortcut links to different functions of the system. Inventory - Takes you to the same page as the Inventory tab where you can view a list of all the inventory items in the account and add new items. 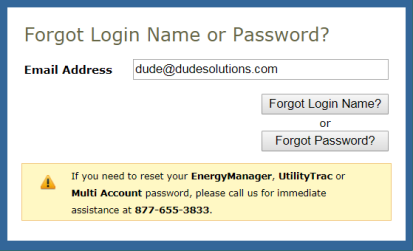 My FacilityDude - Shortcut link to the MyFacilityDude request portal.